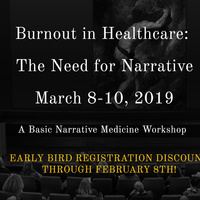 This Basic Workshop provides an intensive introductory experience to the methods and skills of Narrative Medicine, with a special focus on the ways narrative medicine techniques can approach the issues of burnout and moral injury in healthcare, and in the workplace in general. These practices are then applicable to unlimited clinical and non-clinical settings. From Friday at 2 pm to Sunday at 2:30 pm, participants gather for plenary presentations by the founders of the Division of Narrative Medicine alternating with small-group seminars and a guest lecture by Kelley Skeff. Participants will form small groups of eight that stay together throughout the weekend, while small group facilitators rotate through the groups. Plenary presentations by faculty open up themes of how stories work, exploring concepts such as creativity, ethics, bearing witness, and empathy, while the small groups practice rigorous skills in close reading, creative writing, and responding to the writings of others. Close reading is an integral part of the workshop as is short prompted writing and discussion. Participants will gain access to our online resource page prior to the start of the workshop where all information necessary to prepare for the weekend is provided, including literary texts, film, visual art and seminar articles in the field of narrative medicine by leading educators. The Workshop will be held on Friday from 2p-8p, Saturday from 8:30a-5p and Sunday from 8:30a-2:30p. For additional information, email Joseph Eveld at jhe2109@cumc.columbia.edu or call the Division of Narrative Medicine at 212-305-1952. Held at the Columbia University Irving Medical Center campus, these weekends will provide opportunities for individual consultations with faculty, shared meals, informal social gatherings, and access to the cultural offerings of New York City. (Tuition includes meals during workshop hours, and select readings). Participants are responsible for their own travel and accommodations. When available, the early bird registration offers $50 off all tuition fees. Deadline for the early bird special will be updated with the opening of registration. Based on our experience that cohorts of participants from an institution are better able to continue their narrative learning and to ignite narrative projects at their home institution, we now offer a discount of $100 on the tuition for each individual who attends within a cohort of two or more.If you plan to come with a cohort, reach out to Joseph Eveld at jhe2109@cumc.columbia.edu for more information on how to register for the discount. Continuing Education Credits offered for Medicine, Dental, Nursing, and Social Work!